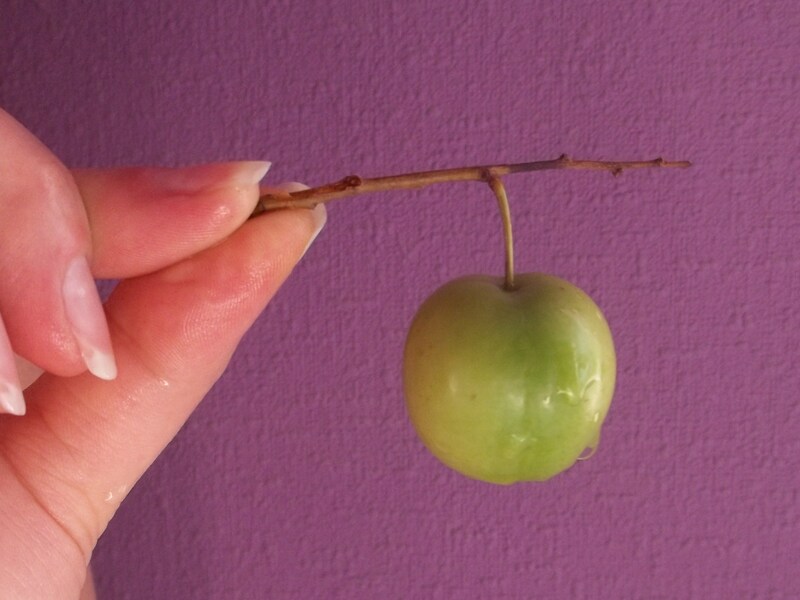 Tkemali (Georgian ტყემალი) is the Georgian name for a variety of wild, sour plum, as well as a sauce made from the plums. 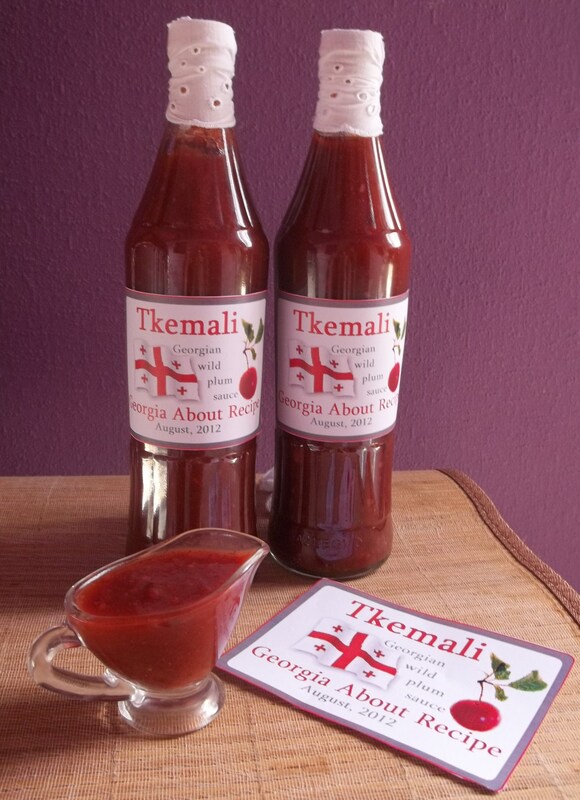 Tkemali sauce is used for fried or grilled meat, poultry and potato dishes, and has a place in Georgian cuisine similar to tomato ketchup in America. 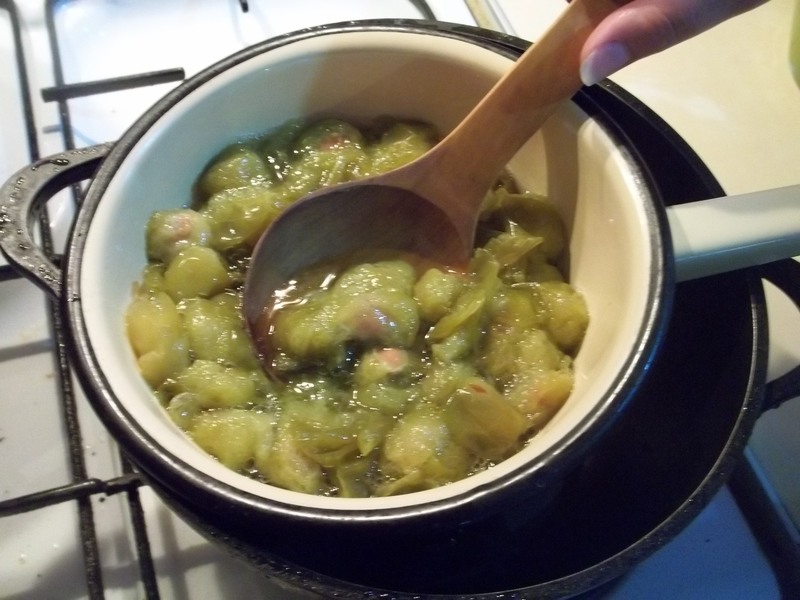 The two main types of plum sauce are green and red. Red sauce is cooked from ripe plums at the end of summer. 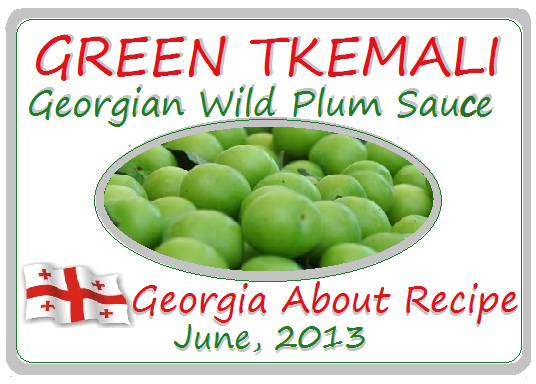 In this recipe we will show how to make green Tkemali sauce, which is prepared from unripe fruit in the Spring. 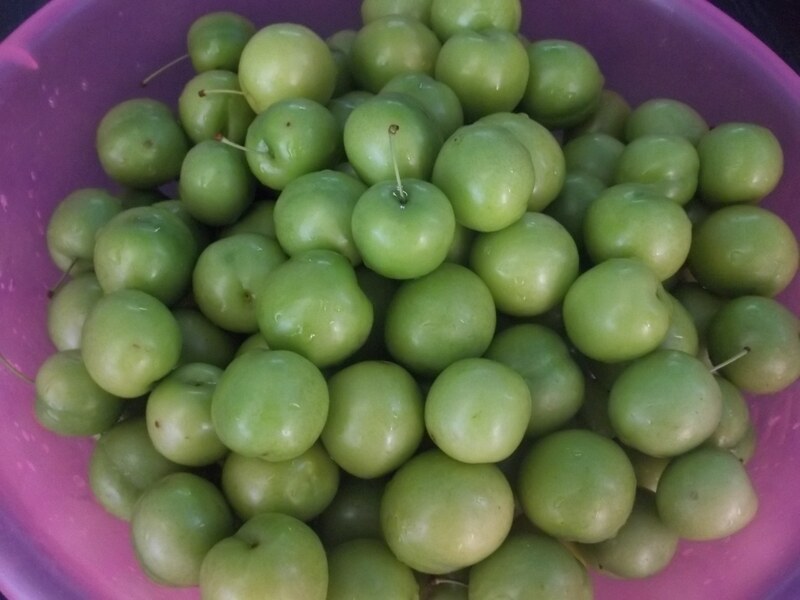 Ingredients (to make up to 3.2 liters): 3 kilos of green (unripe) wild sour plums. 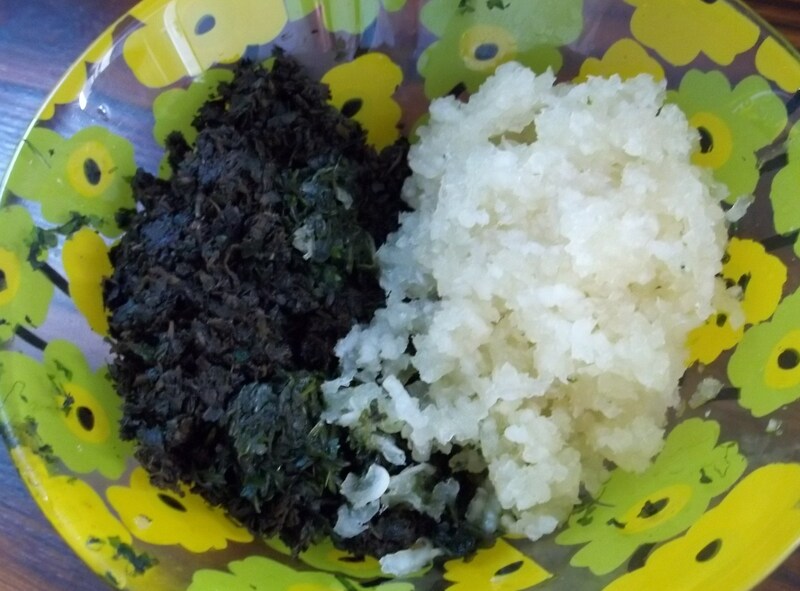 2 large bulbs of garlic, 150 grams of fresh green coriander, 240 grams of fresh dill, 60 grams of fresh Pennyroyal (also called squaw mint, mosquito plant and pudding grass), 60 grams of Summer Savory (optional), 4 green peppers (ground red pepper can be used as substitute), 50-80 grams of sugar (optional and dependent upon the sourness of the plums), and salt (dependent on own preference). 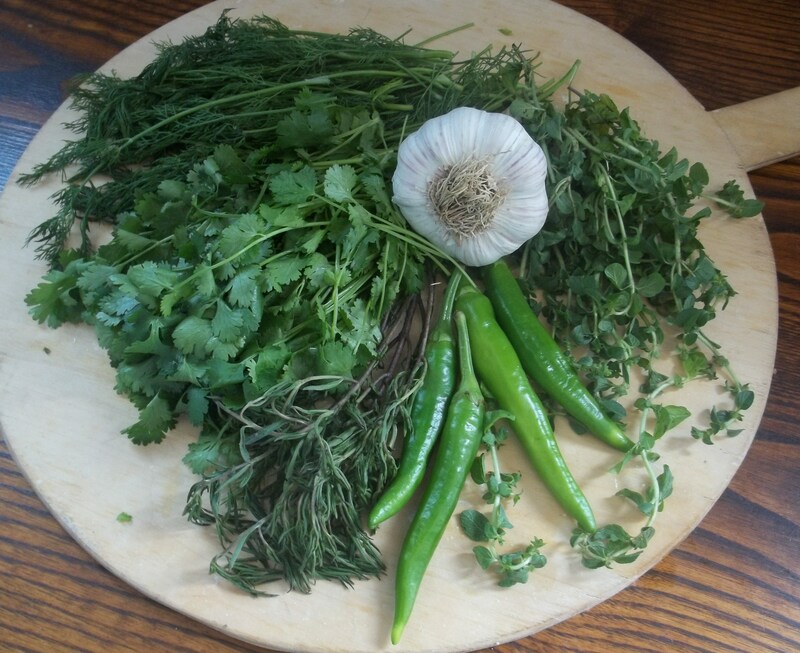 Preparation: Finely chop the coriander, dill and peppers. Strip the leaves from the Pennyroyal and discard the stalks. Finely chop the leaves. Separate the garlic into cloves. Tie the stalks of the Summer Savory together. 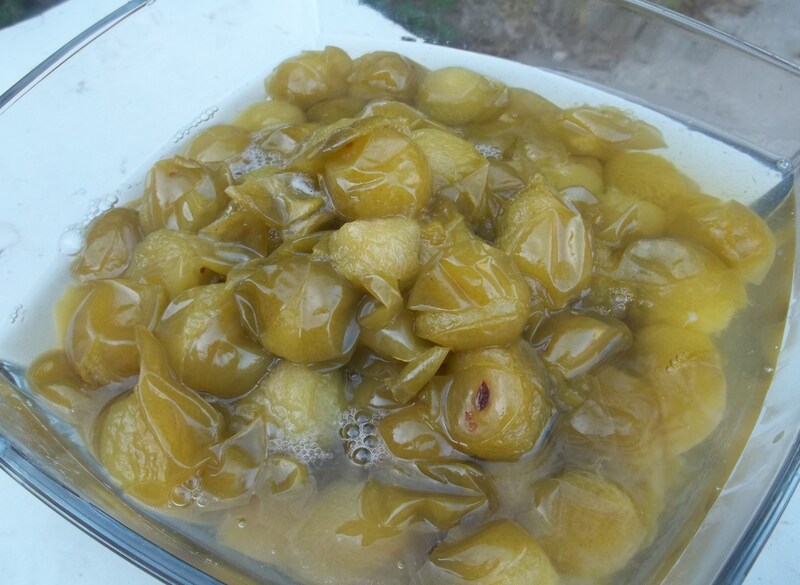 Wash plums and add to a deep pan. 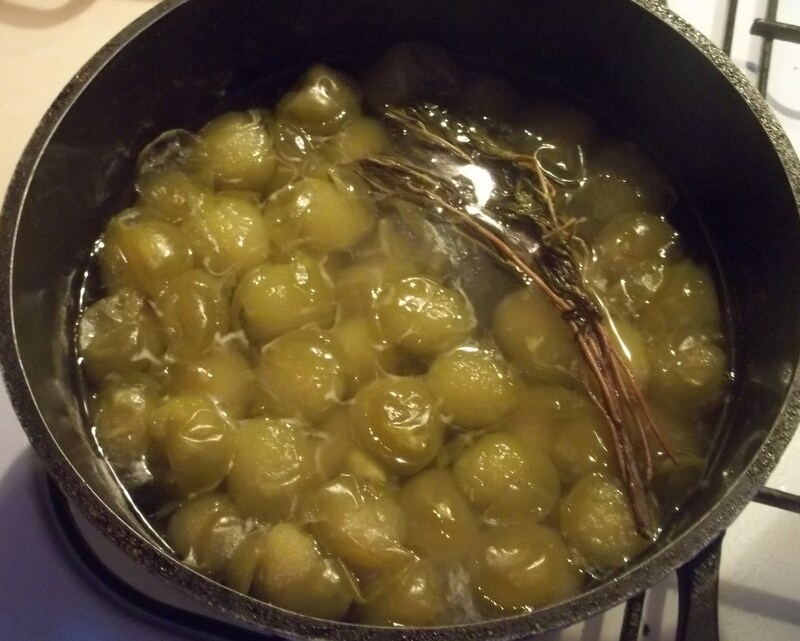 Add water until the plums are covered (no more). Heat on high temperature until the plums are boiled and then reduce temperature to simmer the plums. 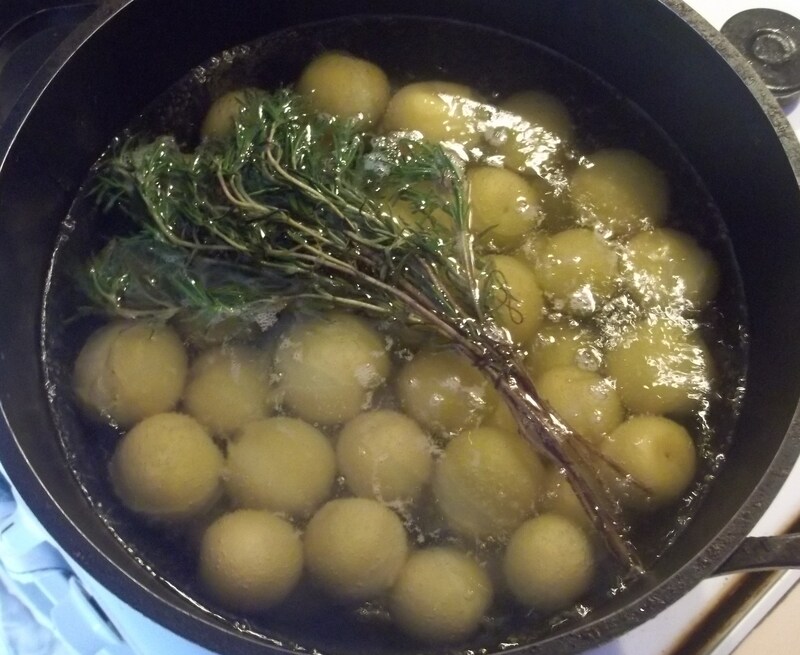 Add the Summer Savory to the simmering plums. 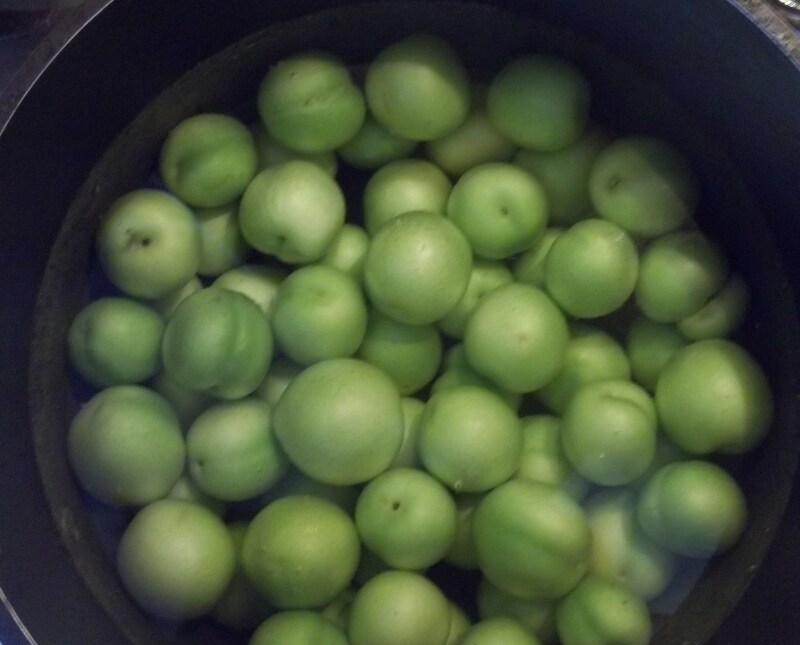 Continue to simmer the plums until they are soft (see picture below). Remove the plums from the pan and add to a bowl and leave to cool. 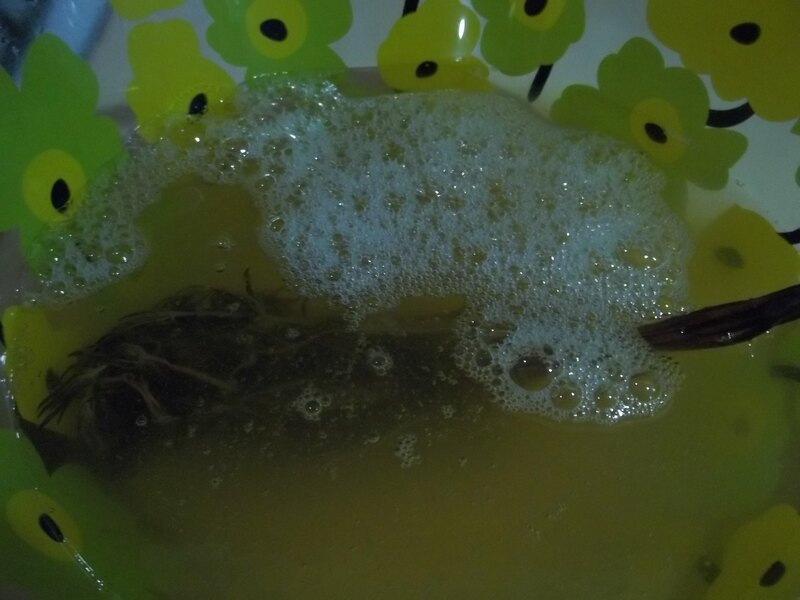 Do not discard the water left in the pan. 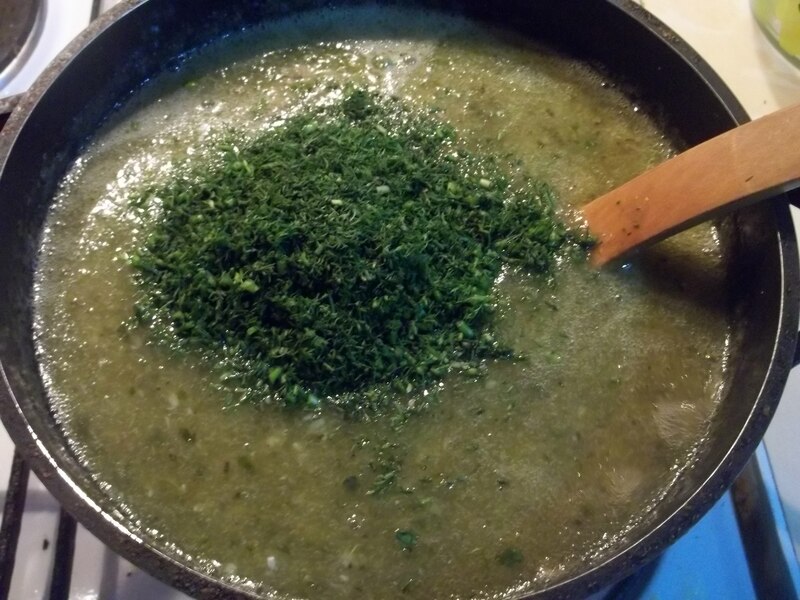 Remove all of the water remaining in the pan and add it, together with the Summer Savory, to a separate bowl. Crush the chopped coriander, Pennyroyal and green peppers together. Crush the garlic cloves separately. 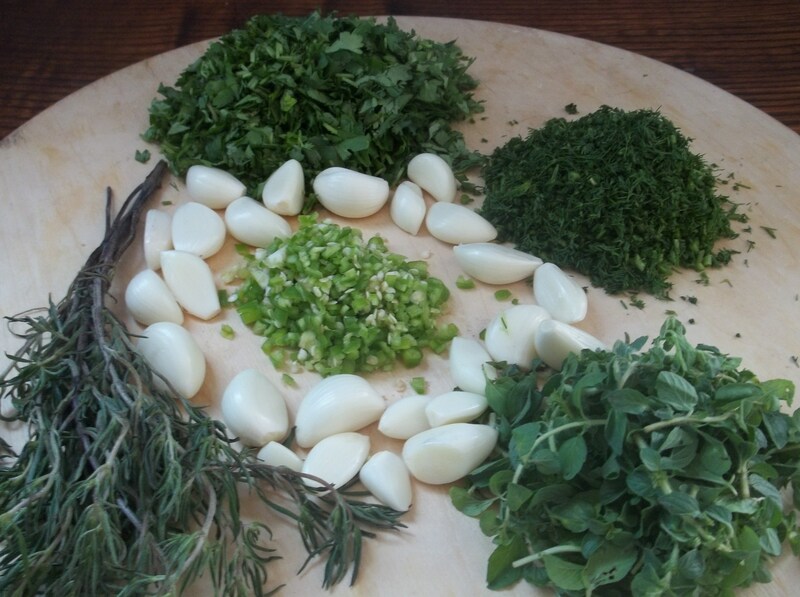 The herb mixture and the crushed garlic should look like the picture below. Place a sieve over a deep pan and add the cooled plums. Gradually add the plum water that was saved after boiling the plums and firmly press the plums with a wooden spoon. 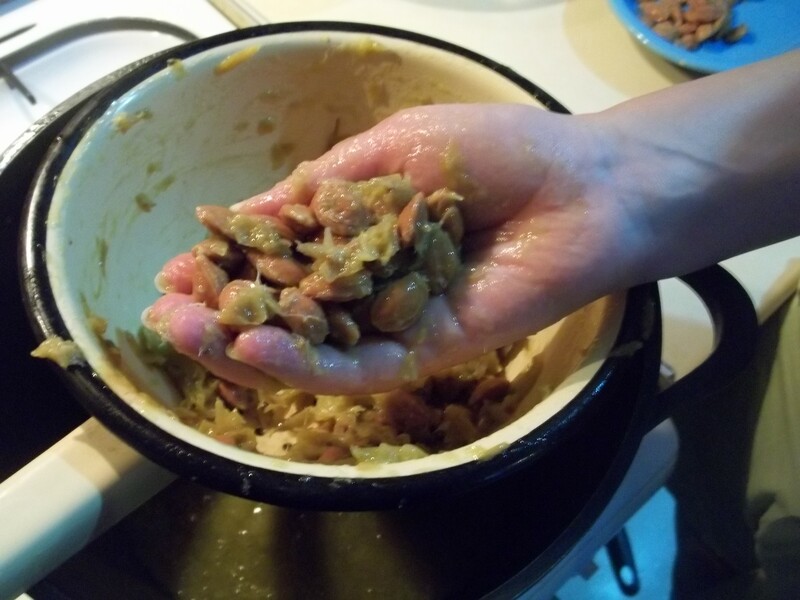 You may need to use your hands to ensure that all of the pulp and juice is strained through the sieve. Discard the plum stones once all of the pulp and juice has been strained into the pan. 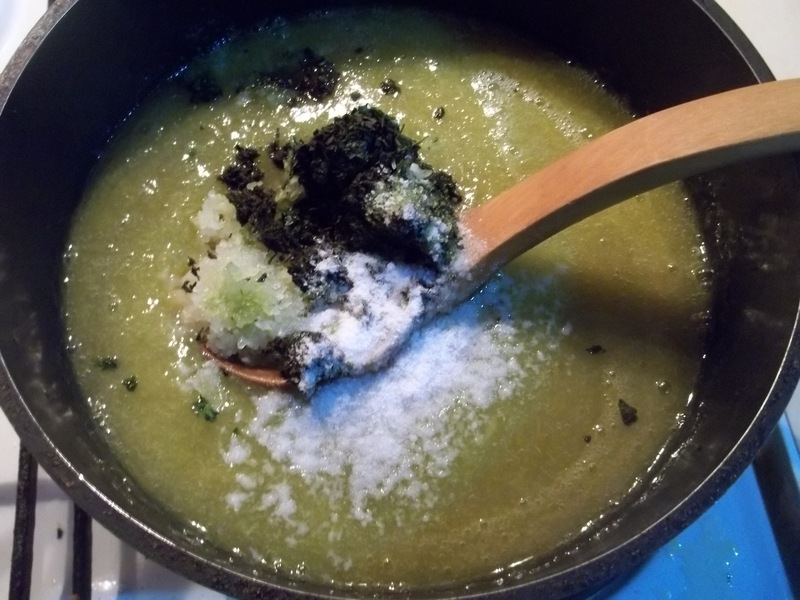 Add the coriander, Pennyroyal and green pepper mixture, together with the crushed garlic. 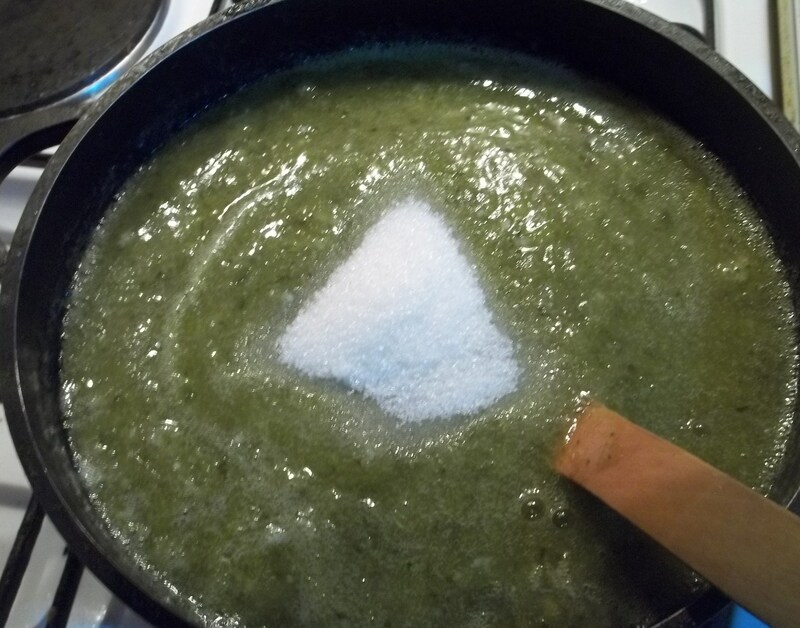 Add salt (to your preference), stir to thoroughly mix and then heat on a medium temperature. 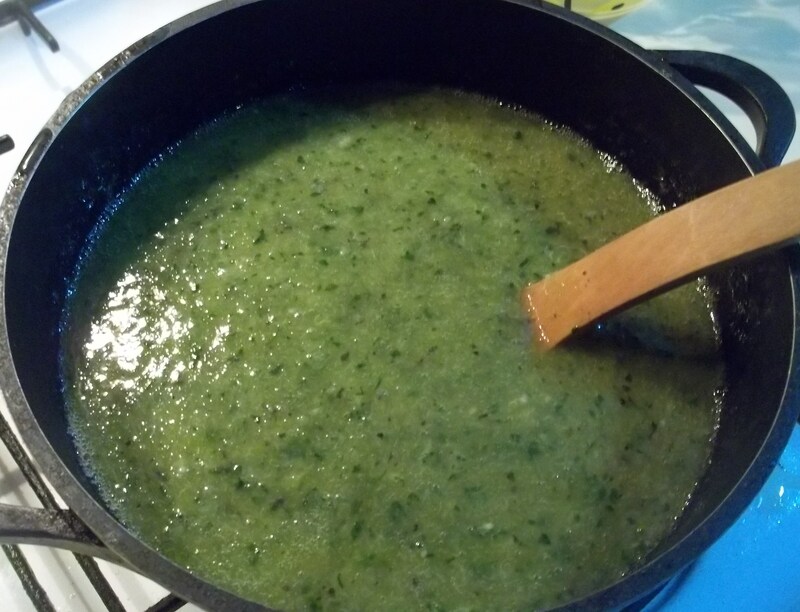 Taste the sauce and if it is too sour add a little sugar (no more than 80 grams) and stir thoroughly. 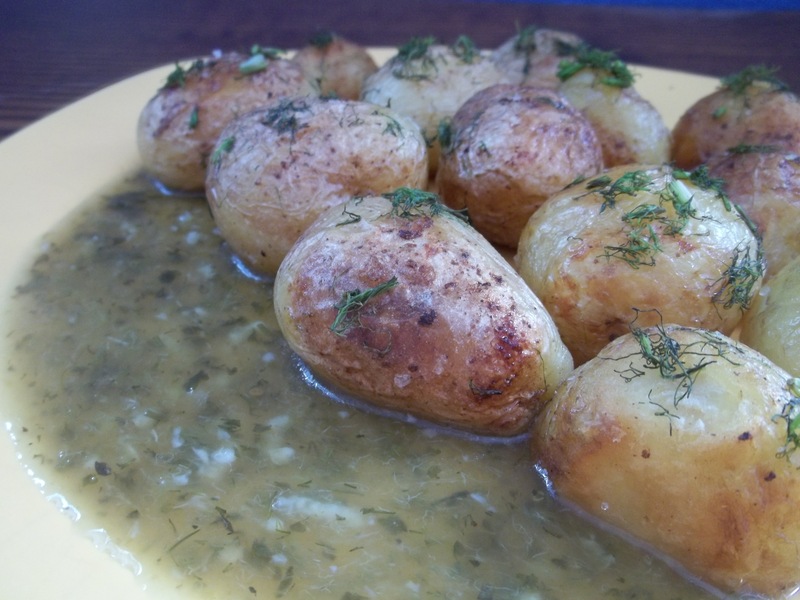 When the sauce has boiled, add the chopped dill. Stir to mix thoroughly and boil the sauce for one minute. The sauce should look like the picture below. Allow the sauce to cool before bottling or storing in glass containers. There is a bottling method that allows the tkemali to be stored for long periods without refrigeration and we will describe the process in a future post. Tkemali sauce can be served with meat, poultry and potato dishes. 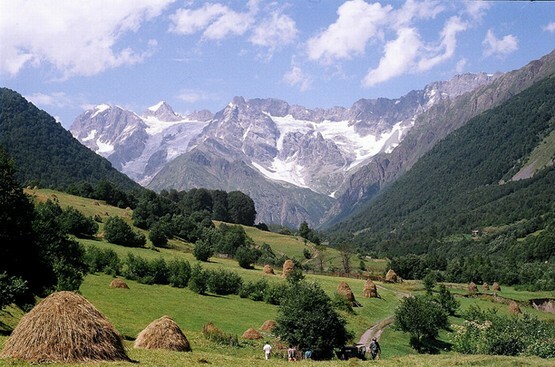 Enjoy Georgia About’s Green Tkemali recipe!